We get a wake-up call from Rob around 9:30 AM. He and I had planned on taking a cab to the airport together at 2 PM today because our flights were close together in time. However, Rob became worried that he would not get on his afternoon flight; he discovered that most flights were overbooked today. He told Marcelo that he was going to go to the airport right now to try to catch an earlier flight. Of course, Marcelo says he will take him to the airport, so he gets ready very quickly and he and Rob leave. I wish I was more awake so I would have remembered to give Rob a big hug goodbye, or maybe even gone with them to the airport! I really like Rob and am so happy I got to meet him finally. But, Michael and I are used to more sleep than Marcelo, and since we went to bed so late, we are groggy and not thinking very clearly. We both go back to sleep immediately, probably even before Marcelo and Rob even got outside of the hotel! Marcelo arrives back at the hotel about an hour or so later and Michael and I finally rouse ourselves awake. Marcelo goes to work on his computer while Michael and I get dressed for the day. Michael then works on his laptop, too. I get myself all packed up to get ready to go, I work on a few of my updates by hand, as I don�t own a laptop, dinosaur woman! Marcelo gets some wonderful news today, a terrific man named Ross Koningstein, a fellow Canadian and employee of Google, is so inspired by Marcelo�s surprise visit to Google�s headquarters with his amazing solar car, that he offers him a matching grant, dollar for dollar! This will enable Marcelo to travel very far; I hope it will take him all the way to Washington, DC! THANK YOU VERY MUCH, ROSS! MERCI! We have breakfast/lunch at Ruby�s Diner about 1:30 pm. Marcelo and Michael take me to the airport next, I am running a little late, but get checked into my flight at 3:05 PM, with 10 minutes to spare before they cancel my reservation! All is well. I have promised Marcelo that I will not be sad this time and I am proud of myself for following through with this promise. I am so glad I got to go the wonderful Canadian reception for him; it will be an occasion I will never forget! I wish I could stay at least another entire week; it is so much fun to travel with the solar car! If you are reading this and wondering if you should volunteer for the solar car crew, this is my advice; �Definitely, go for it! 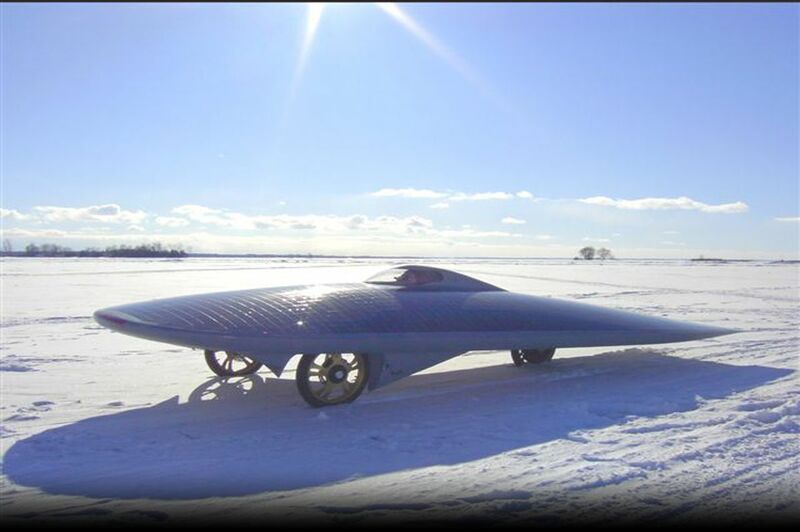 You will not be disappointed by the decision, and it might just change your life!� I smiled so much on the flight from San Jose to Seattle that the two flight attendants near me asked me why I was so happy and I got to tell them all about the solar car, XOF1. I hope they look at the web site and become supporters, too. Thank you, Marcelo, Michael, and Rob! I had a terrific time and would do it all again in a second! After dropping me off at the airport, Michael & Marcelo return to the Crowne Plaza Hotel to pick up the solar car. Mr. David Fransen has offered his official residence as a place for Marcelo to park the solar car every night that he is in Los Angeles, this is very good news for Marcelo. The residence is in a very nice part of LA and is behind a securely locked gate. The employees of the residence are all terrific people and will take good care of the xof1 for Marcelo, this helps Marcelo sleep a little better at night! Our new friend, Diana Williamson has offered her place as a refuge for Michael & Marcelo to stay while in LA, luckily she lives very close to the Consul General�s residence, good news all around! A relatively easy day for Marcelo and Michael; they just have to drive the solar car to Hancock Park and then themselves to Diana�s. After so many busy activities this weekend, it is nice to have a little downtime for the solar car crew, which is only one person now! I predict it isn�t long before the men talk Diana into joining the solar car crew, one of the most exciting and fun experiences of my life!